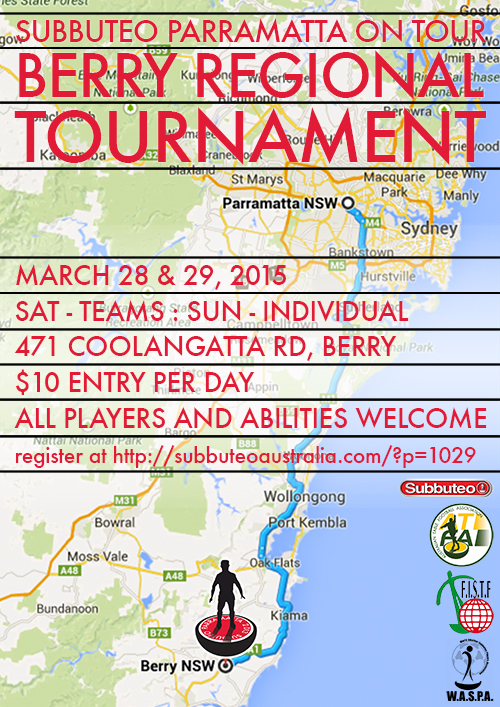 Subbuteo Parramatta is pleased to announce that we will be holding a combined FISTF Satellite/WASPA Regional tournament on Sunday March 29, 2015. 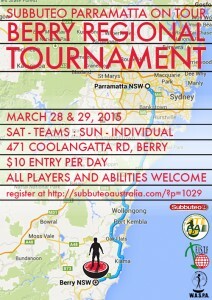 In the spirit of spreading the game into the regional areas of Australia, we will be heading down to Berry, two hours drive south of Sydney, for this tournament. Players of all ages, skill and experience are welcome to enter, and all entrants will play a guaranteed minimum of 3 competitive matches (alongside as many friendlies as you can fit in). We will be running an Opens Individual tournament. If we have enough registrations, we will also run a separate U15s tournament. Start time is subject to numbers but will be at around 10am-ish. Final confirmation of the start time will be sent in the week before the competition. Entry is $10. All games will be played on Astropitches. 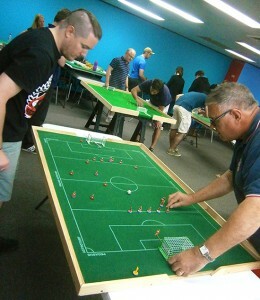 This entry was posted in News, Upcoming tournaments and tagged berry, fistf, fistf challenger, subbuteo parramatta, waspa, waspa tournament on 27/01/2015 by ajebec. 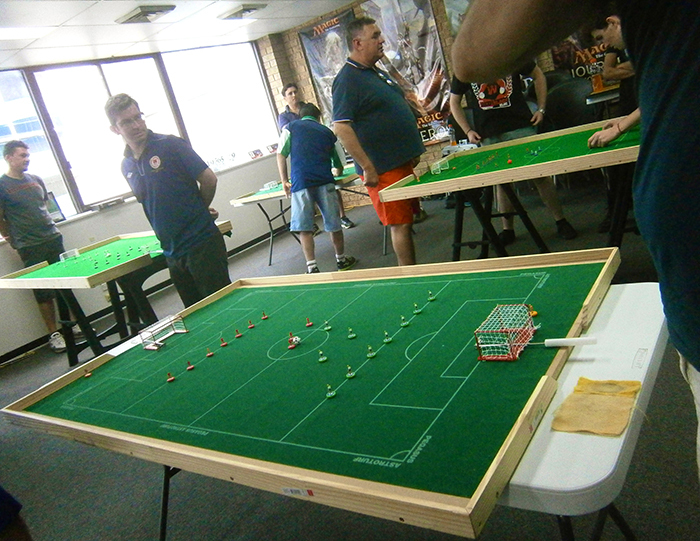 The Subbuteo Parramatta club hosted its first combined FISTF Challenger/WASPA Tournament on the premises of The Games Cube in downtown Parramatta on Saturday, November 15, 2014. A strong field with many of Australia’s best players assembled alongside the devoted but not quite as skilled and a couple of first-time competitors. Waiting for flick-off in the group stage. Splitting into four groups with a FISTF ranked top seed in each, the players went at it from the outset. Notable efforts were made by newcomer, Louis Dettre, who, in his first ever tournament, was drawn against two of Australia’s most experienced players – Steve Dettre (his father) and Robert Green who was in the country for a month from his adopted homeland of Sweden. Louis did well to have his father panicking at 0-0 at half time in their opening game before experience won out 2-0. Gordy Dudley slipped into the quarter finals by virtue of his superior goal difference over Daniele Lombardi. Group winner Eliot Kennedy could only manage to put 7 past Gordy, having previously beaten Daniele by 8 unanswered goals, giving Gordy the edge when he and Daniele played out a goalless draw. Peter Thomas was drawn with two of the Italian contingent, easing past Raffaele Lombardi and Giuseppe Tardiota. Raffaele got the upper hand over Giuseppe in their head-to-head match, putting him through to the quarter finals. In the 4 player group, the opening few results meant that Adrian Elmer needed to beat newcomer Andrea Gandolfi by 3 goals to guarantee a place in the quarters, while Steve Diasinos and David Simpson could still both go through depending on their head to head result. In the end, Adrian managed 5 against Andrea after Andrea had put up an excellent first half display to hold him to just one goal, while Steve took the game, and 1st place in the group, with his victory over David. The two Steves go to extra time in the quarter finals, as do Eliot and Raffaele in the background. This entry was posted in Tournament reports and tagged fistf challenger, results, subbuteo parramatta, the games cube, tournament report, waspa tournament on 16/11/2014 by ajebec. "Tim Cahill's Amazing Goal For Australia"
used with the kind permission of Terry Lee - click here for details.